First manufactured in the year of 1989, the Roland GP-16 is considered by many to be the first digital multi effects processor for guitars on the market. Even though it is now 25 years old, it is still preferred over many newer digital multi effects guitar processors for its efficiency, durability, ease of use, and overwhelmingly, its sound. 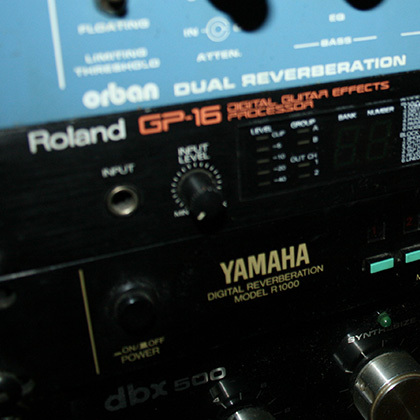 The Roland GP-16 has 4 unbalanced and 2 balanced XLR output connectors, as well as outputs for a bi-amplifier system. It also has midi in/out/thru for midi sync and data transfer as well as a proprietary jack for MIDI Foot control on which two pedals are connected, though the pedals had to be purchased separately. One pedal controls the master volume and the second pedal would control any effects parameter within the GP-16. External MIDI devices can also be used to control the GP-16, or the GP-16 can be used for control over an external device. The Roland GP-16 incorporates 16 different effects and has the ability to chain up 12 effects simultaneously in any combination. These effects include distortion, compression, overdrive, saturation, picking filter, step phaser, parametric equalizer, noise suppressor, short delay, chorus/flanger, spaced chorus, pitch shifter, auto panpot, triple stereo delay, reverb, and a lineout filter. There are 128 different changeable effects programs, all very easily optimizable. Editing parameters is easy with the buttons located on the front of the processor. In addition, Roland made editing software (“GP16 Editor”) which operates on the PC allowing users to edit, store, and transfer parameters with the click of a mouse button. The GP-16 is equipped with 3 extremely high-speed DSP LSIs, developed for audio signal processing in the GP-16. The unit was designed with the focus on sound quality, with 24-bit internal processing. It adopts the 16-bit (64 times over-sampling) leading-edge MASH process for the A/D section, and for D/A employs a 16-bit (4 times over-sampling) process. Altogether, we at Studio 11 believe the Roland GP-16 is an amazing digital effects processor, 100% manufactured with the guitar player in mind, though it works great on other instrumentation and vocals too. We found it’s combination of features and sound quality make it a great choice for creating some exciting new effects in your mix. So give us a call and book your session today, because at Studio 11, we make sound happen.